Once again we teamed up with Fritz Heiler of FritzSpeakers for another fun packed audio show. This time it was the California Audio Show sponsored by Dagogo. 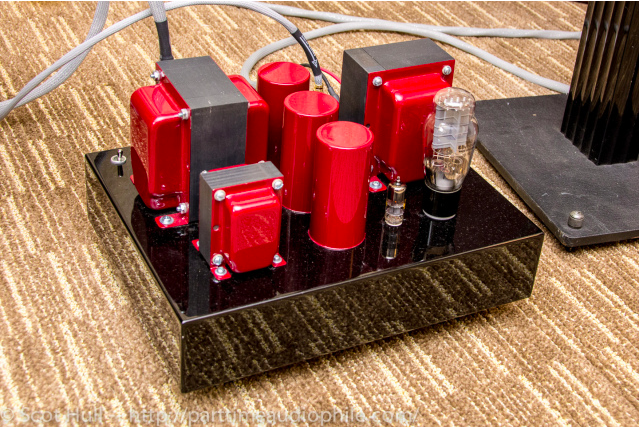 Our room was busy throughout the entire event and we even scored a review from Jack Roberts who took home the Electra-Fideliy A3-500 monoblocks for a listen. Look for the review at Dagogo in the near future. The (self-described) dashing duo of Fritz Heller of Fritz Frequencies and Tony Chipelo of Electra Fidelity joined forces again for this show, and they seemed to be far too happy about it. Just look at these guys [in the shots below]. Nobody who hates his job ever looks like that. That might be because putting a Fritz room together is one of the easier jobs in the business. Fritz makes some floorstanders, but he prefers speakers that are small enough to lift without machinery. His Carrera 7 monitors ($3500 per pair) fronted the room for most of the weekend, and they were making a pretty good argument that small speakers can be a very good idea. 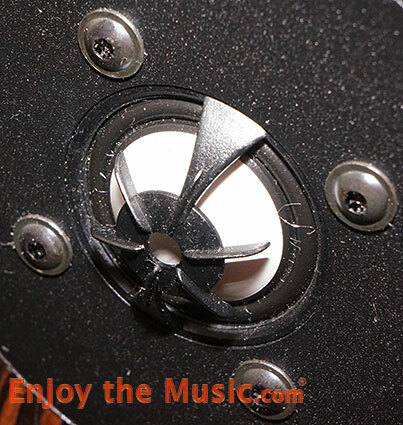 The Carrera 7 may be a 16″ tall shoebox, but it’s only 3db down at 38hz. To put that in perspective, that’s lower and flatter than the pair of Tannoy Glenairs I use at home. In a space like this one, that translates to a very full sonic presentation without ever overloading the room. I’d always assumed that Fritz was just lazy (I kid! I kid! ), but he may be on to something. 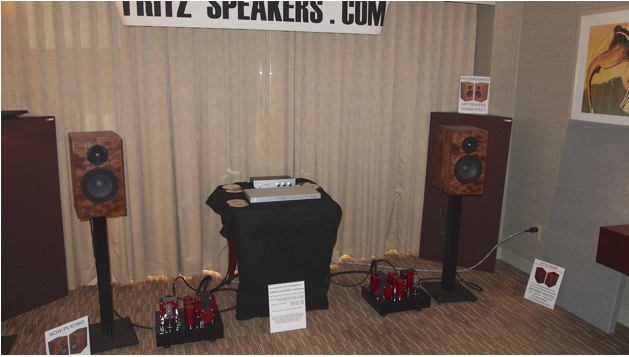 Oddly, Fritz’s little 4 ohm, 88db sensitive shoebox was paired here with the same Electra Fidelity A3-500 monoblocks ($9995) that Tony Chipelo had deployed so successfully at the Newport show in June. Matching all of ten single-ended watts to a speaker like the Carrera 7 is, to say the least, counterintuitive. In this case, though, it was again proven to be a dynamic and wholly satisfying match. But “wholly satisfying” isn’t really good enough for these guys. We made a return visit on Saturday afternoon because Fritz was offering a sneak peek at his new speaker. Unlike the big Carrera, this new box sports a hemp coned driver. Fritz set them up — in true improvisational style — by putting them upside down on top of the Carreras. A quick listen to Shooglenifty proved that Fritz still had a little tweaking to do (the tweeters were a little too eager to rip my face off), but the oh-my-GOD tone coming out of this thing was organic, natural, and instantly likable. Even better? If my notes are correct, this is set to cost less than $1700. It’s even smaller than the Carrera 7, too. I told you that Fritz hates lifting things. For completeness sake, I should mention that the source here was a Resolution Audio Cantata ($7000) and all the cabling came from Triode Wire Labs. None of those things are heavy either. Click HERE to go to the article as published on The Audio Traveler website. Fun with FritzSpeakers Carrera 7s driven by Electra-Fidelity A3-500 tube mono ($3500 and $9995 per pair respectively) here at CAS 2014 in San Francisco. Look for the review at dagog in the near future.This 'lil two-way design sounded bigger than their diminutve size dictates with the help of 1" ring radiator tweeter and ScanSpeak 7" paper midrange/woofer. 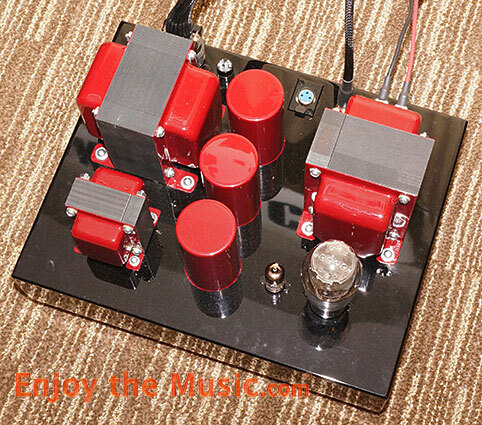 The electrifying elegant Electra-Fidelity A3-500 tube monoblock amplifier uses a Sovtek 6A3 for output and 12AT7 (or 6ER5) for driver duties within Jack Elliano's proprietary Class A3 design with Low IMD circuit. Their low IMD two-stage section uses an algebraic summing loop to lower IMD. This provides higher sound quality and prceived power output of 10 watts. Love the red-colored highlights too! Click HERE to go to the article as published on the Enjoy the Music website. Year in and year out tiny Fritz Loudspeakers (above) makes a strong impression with its reasonably priced high quality wares. This year it was the Carrera $3500 a classic no-nonsense box, two way with an uncanny and rangy musicality. Specifically a terrific dynamic range (often the Achilles heel of smaller monitors) that produces an open unconstricted sound. These performed well in the company of Electra Fidelity amplification, driven by a Resolution Audio Cantata Music center and Triode Wire labs cabling. Click HERE to go to the article as published on The Absolute Sound website.